Acquired immune responses elicited to recent strains of seasonal H1N1 influenza viruses provide limited protection against emerging A(H1N1) pandemic viruses. Accordingly, pre-existing or rapidly induced innate immune defenses are of critical importance in limiting early infection. Respiratory secretions contain proteins of the innate immune system, including members of the collectin and pentraxin superfamilies. These mediate potent antiviral activity and act as an initial barrier to influenza infection. In this study, we have examined the sensitivity of H1N1 viruses, including pandemic virus strains, for their sensitivity to collectins (surfactant protein [SP]-D and mannose-binding lectin [MBL]) and to the pentraxin PTX3. 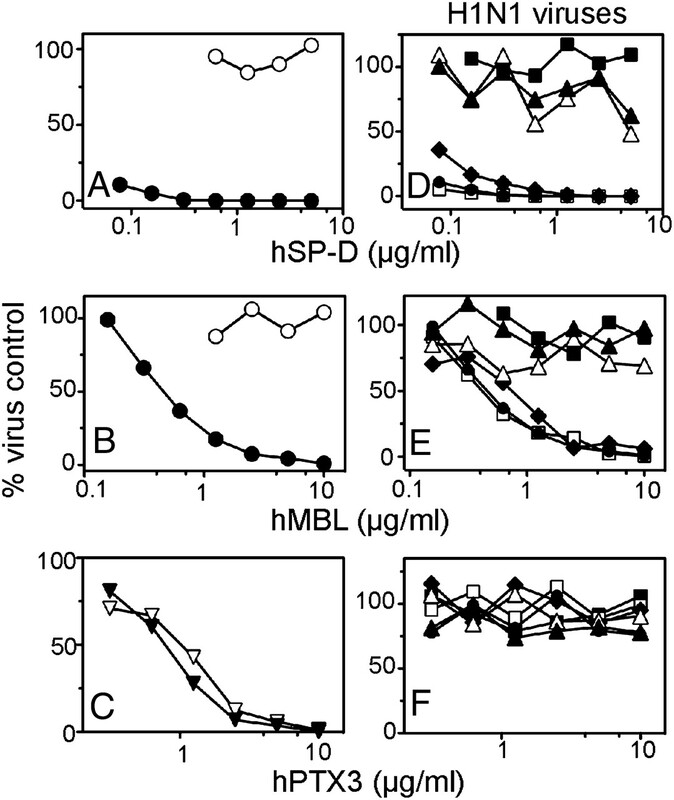 Human SP-D and MBL inhibited virus-induced hemagglutinating activity, blocked the enzymatic activity of the viral neuraminidase, and neutralized the ability of H1N1 viruses to infect human respiratory epithelial cells in a manner that correlated with the degree of glycosylation in the globular head of the hemagglutinin. Recent seasonal H1N1 viruses expressed three to four N-glycosylation sequons on the head of hemagglutinin and were very sensitive to inhibition by SP-D or MBL, whereas A(H1N1) pandemic viruses expressed a single N-glycosylation sequon and were resistant to either collectin. Of interest, both seasonal and pandemic H1N1 viruses were resistant to PTX3. Thus, unlike recent seasonal H1N1 strains of influenza virus, A(H1N1) pandemic viruses are resistant to the antiviral activities of innate immune proteins of the collectin superfamily. Since April 2009, a global outbreak caused by the novel pandemic H1N1 influenza virus (A[H1N1] pdm) has spread to numerous countries and infected over 300,000 individuals with at least 16,000 confirmed human deaths worldwide (1). The A(H1N1) pdm virus is not the first H1N1 influenza A virus (IAV) to cause a pandemic in humans. The 1918 Spanish H1N1 IAV infected ∼25% of the human population and was associated with at least 50 million deaths worldwide (2). In subsequent years, H1N1 IAV continued to circulate in the human population causing seasonal epidemics and a number of severe outbreaks between the 1920s and the 1950s (3). In 1957, the appearance of a novel H2N2 influenza virus was associated with the disappearance of H1N1 IAV; however, in 1977, a H1N1 virus with a close genetic and antigenic similarity to an early 1950s human H1N1 virus re-emerged in the human population (4, 5). From 1977 to present day, seasonal H1N1 and H3N2 type A viruses, as well as type B viruses, continue to cause seasonal epidemics in humans. The A(H1N1) pdm virus contains a unique combination of gene segments from both North American and Eurasian swine lineages and is antigenically distinct from contemporary human seasonal H1N1 IAV (6, 7). As such, there has been significant concern that little protective immunity exists in the general human population. This concern was confirmed by reports that neutralizing Abs against A(H1N1) pdm were found almost exclusively in people born before 1957 (8, 9) and that recent seasonal vaccines induced little or no cross-reactive Ab responses to A(H1N1) pdm viruses in children or adults (10). Of interest, A(H1N1) pdm viruses and seasonal H1N1 strains have also been shown to differ in pathogenicity in animal models of infection (8, 11, 12). Together, these data highlight the need to better understand the mechanisms underlying disease pathogenesis of A(H1N1) pdm in humans. Respiratory secretions and airway fluids contain a complex mixture of proteins, lipids, and phospholipids, including proteins of the innate immune system that are known to recognize and inhibit certain strains of influenza virus. In general terms, such innate inhibitors of influenza virus belong to families of proteins that are highly conserved in evolution and include members of the collectin and pentraxin superfamilies. In humans, members of the collectin family that mediate antiviral activity against influenza viruses in vitro include surfactant protein (SP)-D, SP-A, and MBL. SP-D and MBL bind to mannose-rich glycans on the hemagglutinin (HA) and neuraminidase (NA) glycoproteins of different virus strains to inhibit the hemagglutinating activity of the virus (13–15), neutralize virus infectivity (14–16), aggregate virions (14, 16–18), and inhibit the enzymatic activity of the viral NA (19, 20). SP-D is particularly potent in its ability to inhibit virus strains bearing high levels of glycosylation on the globular head of HA (14, 15, 21, 22). In contrast to SP-D and MBL, SP-A is a sialylated glycoprotein that acts against influenza virus by competing with sialylated cell surface receptors for binding to the viral HA (13). The long pentraxin PTX3 also acts as a sialylated receptor analog and mediates potent inhibition of influenza viruses in vitro and in vivo (23). Virus strains show considerable variation in both the number and location of N-glycosylation sequons (asparagine (Asn)-Xaa-Ser/Thr, where X represents any amino acid except proline) on their HA/NA surface glycoproteins. Amino acid substitutions associated with the appearance of oligosaccharides on the globular head region of HA are believed to effectively mask or modify antigenic sites from neutralizing Ab, and therefore represent an important immune evasion mechanism. Since their appearance in the human population in 1968, H3N2 subtype viruses have shown a progressive increase in N-linked glycosylation (24, 25) and recently circulating strains generally carry six to seven potential sites in the globular head region of HA. Recent seasonal H1N1 viruses carry four to five N-glycosylation sequons on the head of HA (25, 26) compared with the prototypic 1918 H1N1 pandemic strain A/South Carolina/1/18 (SC18), which carried a single site (27). Previous studies have shown that increased glycosylation of H3 subtype viruses correlated with enhanced susceptibility to rodent SP-D and MBL and reduced virulence in mice (15, 28), although highly glycosylated viruses could elicit severe disease in SP-D–deficient mice (28). In the current study, we have determined the location of potential sites of N-glycosylation on the HA and NA of H1N1 viruses, including strains of A(H1N1) pdm, and investigated the susceptibility of different H1N1 viruses to the antiviral activities of human SP-D, MBL, and PTX3. Seasonal H1N1 viruses showed considerable variation in the number and location of N-glycosylation sites on HA and in their sensitivity to SP-D and MBL, whereas all strains tested were resistant to PTX3. In contrast, most A(H1N1) pdm viruses carried a single N-glycosylation site (Asn104) on the head of HA and were resistant to the antiviral activities of SP-D, MBL, and PTX3. The seasonal H1N1 subtype IAV strains used in these studies were A/NWS/33 (NWS/33), A/WS/33 (WS/33), A/PR/8/34 (PR8/34), A/Bellamy/42 (Bel/42), A/USSR/90/77 (USSR/77), A/Brazil/11/78 (Brazil/78), A/Solomon Islands/3/06 (Sol/06), and A/Brisbane/59/07 (Bris/07). A(H1N1) pdm virus strains used were A/Californina/7/09 (Cal/09) and A/Auckland/1/09 (Auck/09). HKx31 (H3N2), a laboratory-derived high-yielding reassortant of PR8/34 bearing the HA and the NA from A/Aichi/2/68 (H3N2) (29), was also used. All viruses were obtained from the World Health Organization Collaborating Centre for Reference and Research on Influenza (Melbourne, Australia). Viruses were grown in eggs and purified from allantoic fluid by rate zonal sedimentation on 25–75% w/v sucrose gradient, as described (30). The concentrations of protein in purified virus samples were measured by the addition of Bradford protein dye (Bio-Rad, Hercules, CA). A standard curve using BSA was constructed, and the OD was determined at 595 nm. Titres of infectious virus were determined by standard plaque assay on Madin-Darby canine kidney cells (31). Reassortant influenza viruses used in this study were generated by 8-plasmid reverse genetics, as previously described (32). Viruses were 7:1 reassortants consisting of the PR8/34 backbone with the HA gene from either of the following: 1) PR8/34; 2) PR8/34, which had been sequentially modified by site-directed mutagenesis to encode additional sites of N-glycosylation (see below); or 3) Brazil/78. Oligonucleotide primers were designed from the consensus sequence for PR8/34 to create the Asn-Xaa-Ser/Thr sequon at positions 104, 144, 172, and 177 identical to those present in the HA sequence of Brazil/78. The rescued viruses were recovered after 3 d and amplified in the allantoic cavity of 10-d-old embryonated eggs. Viruses generated by reverse genetics are referred to as RG-PR8 HA (wild-type), RG-PR8 HA (+104), RG-PR8 HA (+144), RG-PR8 HA (+172), RG-PR8 HA (+177), and RG-Brazil/78 HA, respectively. Viral RNA was extracted from H1N1 viruses using Qiamp Viral RNA Mini Kit, according to manufacturer’s instructions (Qiagen, Valencia, CA). RT-PCR was performed using H1 HAI- and N1 NAI-specific primers and the Superscript III Platinum One-Step RT-PCR system (Invitrogen, Carlsbad, CA). The specific primers used were H1F, 5′-TGTAAAACGACGGCCAGTCAACCAAAATGAAAG-3′; H1R, 5′-CAGGAAACAGCTATGACCGCAATGGCTCCAAACAAACCTCT-3′; N1F, 5′-TGTAAAACGACGGCCAGTAGCAAAAGCAGGAGT-3′; and N1R, 5′-CAGGAAACAGCTATGACCGGRCCATCGGTCATTATG-3′, and the following PCR condtions were used: 50°C for 30 min, 94°C for 2min, 35 cycles of 94°C for 30 s, 55°C for 30 s, 68°C for 1 min, and then final extension at 68°C for 1 min. PCR products were purified and sequenced, and sequences were assembled using the Lasergene Seqman package (DNAStar7). GenBank accession numbers (http://www.ncbi.nlm.nih.gov/Genbank/) for the genes sequenced in this paper are as follows: HQ008256-HQ008267, CY031336, CY030230, CY030231, EF566040, EU124136, and EU124137. Potential sites of N-linked glycosylation were predicted using the NetNGlyc 1.0 server (http://www.cbs.dtu.dk/services/NetNGlyc) provided by the Centre for Biological Sequence Analysis, Technical University of Denmark (Lyngby, Denmark). Sites of N-linked glycosylation are defined using the H1 numbering system, unless otherwise stated. Crystal structures of HA (Brookhaven Protein Data Bank [PDB] ID: 1RU7, http://www.pdb.org/pdb/explore/explore.do?structureId=1RU7) (33) and NA (PDB ID: 2HTY, http://www.pdb.org/pdb/explore/explore.do?structureId=2HTY) (34) were obtained from Research Collaboratory for Structural Bioinformatics Protein Data Bank, and modeling was performed using PDB ProteinWorkshop 3.7 software developed by Moreland et al. (35). Recombinant human SP-D dodecamers were prepared by maltosyl-agarose affinity chromatography and gel filtration, as previously described (36). Human MBL, a gift from the Australian Red Cross Blood Service (Brisbane, Australia), was prepared by affinity purification from pooled human plasma using mannan agarose (37). Human recombinant PTX3 was purified from the supernatants of Chinese hamster ovary cells expressing the protein and biotinylated, as described (38). Hemagglutination titrations and hemagglutination inhibition (HI) assays were performed by standard procedures in 96-well microtitre plates with 1% (v/v) turkey RBCs. Assay buffer used was either TBS (0.05 M Tris-HCl, 0.15 M NaCl [pH 7.2]) alone, TBS + 10 mM CaCl2, or TBS + 5 mM EDTA. To examine binding of SP-D, MBL, or PTX3 to influenza viruses, wells of a microtitre tray were coated with increasing concentrations of purified virus in TBS, blocked for 1 h with 10 mg/ml BSA, and washed with TBS containing 0.05% Tween 20 and 10 mM CaCl2 (TBST-Ca2). Samples were incubated for 2 h with either human SP-D (0.5 μg/ml), human MBL (1 μg/ml), or biotinylated human PTX3 (bPTX3; 1 μg/ml) in TBS containing 10 mg/ml BSA and either 10 mM CaCl2 (BSA10-TBS-Ca2) or 5 mM EDTA (BSA10-TBS-EDTA), and then washed. Binding of SP-D was detected by the addition of a polyclonal rabbit anti-human SP-D Ab, followed by the addition of HRP-conjugated sheep anti-rabbit (sheep anti-rabbit HRP; SILENUS Labs, Boronia, Australia). Binding of MBL was detected by the addition of rabbit antiserum raised against human MBL, followed by sheep anti-rabbit HRP. Binding of bPTX3 was detected by the addition of streptavidin-conjugated HRP (GE Healthcare, Buckinghamshire, U.K.). Equivalent coating levels of purified virus preparations were confirmed with the use of mAb 165, which binds to the host-derived carbohydrate Ag characteristic of egg-grown influenza viruses. Influenza virus NA activity and its inhibition by pentraxins were measured by an ELISA in which biotinylated peanut agglutinin (Pierce Biotechnology, Rockford, IL) was used to detect galactose residues exposed after removal of sialic acid from fetuin (Sigma-Aldrich, St. Louis, MO). Inhibition of NA activity by SP-D, MBL, and PTX3 was performed, as described (15). Neutralization of influenza virus infectivity was measured by fluorescent-focus reduction in monolayers of A549 cells (human airway epithelial cells line) cultured in 96-well plates, as described (15). A549 were grown and maintained in DMEM (Life Technologies, Auckland, New Zealand), supplemented with 4 mM l-glutamine, 5 × 10−5 2-ME, 100 IU penicillin (CSL, Parkville, Australia), 10 μg/ml streptomycin (ICN Biochemicals, Aurora, OH), and 10% FCS (JRH Biosciences, Lenexa, KS). Dilutions of human SP-D, MBL, or PTX3 were prepared in TBS + 10 mM CaCl2 and mixed with a standard dilution of virus for 30 min at 37°C and added to A549 cells for 1 h at 37°C. Cells were washed and incubated for an additional 6 h at 37°C. Influenza virus-infected cells were detected using mAb clone MP3.1092.IC7 for detection of influenza virus nucleoprotein (World Health Organization Collaborating Centre for Reference and Research on Influenza, Melbourne, Australia), followed by FITC-conjugated sheep anti-mouse Ig (SILENUS Labs). The total number of fluorescent foci in four representative fields was counted and expressed as a percentage of the number of foci in the corresponding area of duplicate control wells infected with virus alone. To test for inhibition by mannan, diluted SP-D was incubated with mannan for 30 min at room temperature prior to the addition of virus. Glycans attached to the HA glycoprotein act as a target for recognition of influenza viruses by collectins, such as SP-D and MBL (15, 39, 40). In particular, the degree of glycosylation on the globular head of HA is a critical factor in determining the sensitivity of different virus strains to the antiviral activities of collectins (15, 28, 39), although binding to the NA glycoprotein has also been reported (15, 41). Therefore, we sequenced the HA and NA of representative seasonal H1N1 viruses from the 1930/40s, 1970–1990s, and 2000s, as well as two strains of A(H1N1) pdm viruses, and used NetNGlyc 1.0 server to predict the location of N-linked glycosylation sites. The predicted N-glycosylation sites on the globular head of HA (Table I) and NA (Table II) and their corresponding locations on the crystal structures of HA (Fig. 1A) and NA (Fig. 1B) are shown using PDB ProteinWorkshop 3.7 software. Location of potential sites of N-linked glycosylation on HA (A) and NA (B) of H1N1 subtype viruses. Residues in purple represent the Asn residue of potential sites of N-linked glycosylation (Asn-Xaa-Ser/Thr). Images were prepared using PDB ProteinWorkshop 3.7 software based on the crystal structures of 1934 human H1-HA (PDB code: 1RU7) and avian H5N1-NA (PDB code: 2HTY). Residue numbering is on the basis of H1 and N1 numbering, respectively. The HA glycoprotein is composed of two structurally distinct regions, the globular head and the stem (42). Glycosylation sites in the head region of H1 tend to cluster in two distinct regions (Fig. 1A) at the base (Asn71, Asn73, and Asn104) or in the globular head region of HA (Asn142, Asn144, Asn172, Asn177, and Asn179). The HA of 1930s mouse-adapted H1N1 viruses were poorly glycosylated with a single site (Asn73) present on NWS/33, and no glycoyslation sites present on the head of HA of WS/33 or PR8/34. In contrast, three to four glycosylation sites were present on the HA head of all other seasonal H1N1 viruses tested (1942–2007). Of interest, only one site of N-linked glycosylation (Asn104) was predicted on the HA head of the A(H1N1) pdm viruses Cal/09 and Auck/09. Note that the predicted N-glycosylation sites in the head of N1 were more conserved in regard to both number (2, 3) and location (Asn88, Asn146, and Asn235) for seasonal and pandemic H1N1 viruses when compared with the H1 HA (Fig. 1B, Table II). Respiratory secretions contain a complex mixture of innate immune proteins, including members of the collectin and pentraxin superfamilies, known to mediate antiviral activity against IAV. To determine whether human collectins (SP-D and MBL) and pentraxins (PTX3) could bind to H1N1 viruses, wells of a microtitre plate were coated with increasing concentrations of the purified viruses, and the binding of each of the innate proteins was examined by ELISA. For comparison, the prototype H3N2 virus strain HKx31 was also included. HKx31 has two potential sites of N-linked glycosylation on the head of HA at residues 81 and 165 (H3 numbering; corresponding to residues 90 and 179 in H1 numbering). Consistent with previous reports (14–16), SP-D (Fig. 2A) and MBL (Fig. 2B) bound to HKx31 in a Ca2+-dependent manner, whereas binding of bPTX3 to HKx31 was unaffected in the presence of EDTA (Fig. 2C). H1N1 virus strains Bel/42, Brazil/78, and Sol/06 carry three to four potential glycosylation sites on the head of HA (Table I), and each virus bound similar levels of human SP-D (Fig. 2E) or MBL (Fig. 2F). In contrast, the PR8/34 strain carries no glycosylation on the head of HA and bound very low levels of SP-D and MBL. The A(H1N1) pdm virus strains Cal/09 and Auck/09 were also poor in their ability to bind either SP-D or MBL. All binding of SP-D or MBL to H1N1 viruses was abrogated in the presence of 5 mM EDTA (data not shown). Binding of human SP-D, MBL, and PTX3 to purified HKx31 (H3N2) and H1N1 viruses. 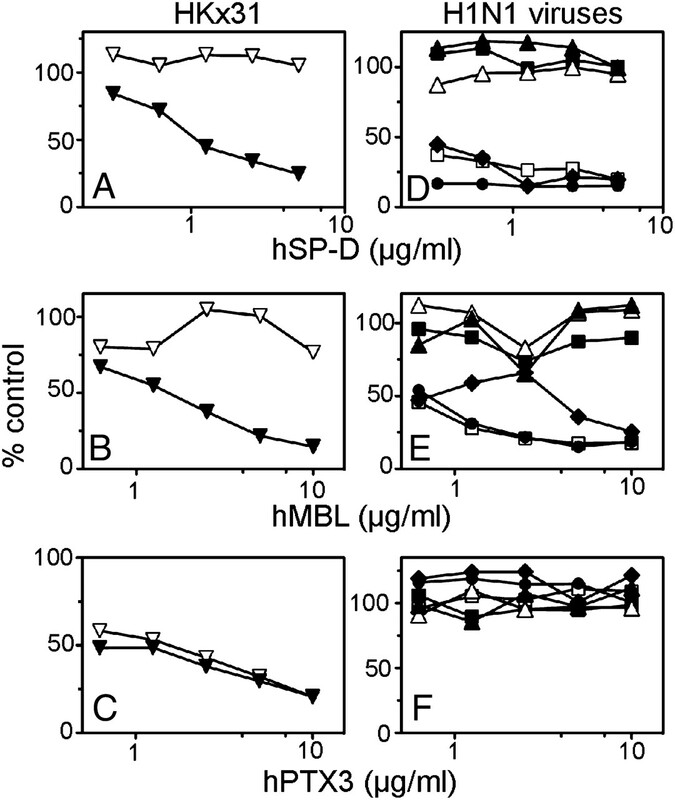 Human SP-D (A; 0.5 μg/ml), MBL (B; 1 μg/ml), and bPTX3 (C; 1 μg/ml) in BSA5TBS-T containing 5 mM CaCl2 (▼) or 5 mM EDTA (▽) were applied to wells coated with increasing concentrations of purified HKx31. Human SP-D (D; 0.5 μg/ml), MBL (E; 1 μg/ml), and bPTX3 (F; 1 μg/ml) in BSA5TBS-T containing 5 mM CaCl2 were applied to wells coated with increasing amounts of purified H1N1 viruses PR8/34 (▪), Bel/42 (□), Brazil/78 (●), Sol/06 (♦), Cal/09 (▴), and Auck/09 (△) in BSA5TBS-T containing 5 mM CaCl2. Binding of innate immune proteins to influenza viruses was determined by ELISA, as described in Materials and Methods. Data are representative of three independent experiments. SP-D and MBL showed a similar hierarchy of binding to different H1N1 virus strains, and this pattern was very different from that obtained using PTX3. Although PTX3 bound to H3N2 virus strain HKx31 (Fig. 2C), it did not show significant binding to any of the H1N1 viruses tested (Fig. 2F). Binding of the influenza virus HA to sialic acid residues expressed on cell surface glycoproteins and glycolipids is a critical first step in the initiation of infection. We therefore determined the ability of SP-D, MBL, and PTX3 to block the function of the HA glycoprotein, as measured by their ability to inhibit the hemagglutinating activity of H1N1 viruses. Results of HI assays are expressed as the minimum inhibitory concentration (MIC; in μg/ml) of purified SP-D, MBL, or PTX3 required to inhibit 4 hemagglutinating units of each virus tested (Table III). MBL was a potent inhibitor of the HA activity of Bel/42, USSR/77, Brazil/78, Sol/06, and Bris/07 (MIC < 0.1 μg/ml), all of which bear three to four potential glycosylation sites on the head of HA (Table I), and showed weaker inhibitory activity against NWS/33, WS/33, Cal/09, and Auck/09. PR8/34, which lacks glycosylation on the head of HA, was resistant to MBL (MIC > 10 μg/ml). We did not examine the sensitivity of all virus strains to SP-D; however, Bel/42 was shown to be very sensitive to inhibition (MIC = 0.04 μg/ml) compared with PR8/34, Cal/09, orAuck/09. HI activity of MBL and SP-D against all virus strains tested was abrogated (MIC > 10 μg/ml and 5 μg/ml for MBL and SP-D, respectively) in the presence of 5 mM EDTA. PTX3 mediated HI activity against H3N2 virus strain HKx31 in the presence or absence of Ca2+ (MIC = 0.63 μg/ml in 10 mM CaCl2 versus > 10 μg/ml in 5 mM EDTA), but concentrations of up to 10 μg/ml PTX3 did not inhibit any of the H1N1 virus strains tested (Table III). The influenza virus NA has enzymatic activity and acts to cleave sialic acid residues to facilitate the release of newly synthesized virions from the surface of virus-infected cells. Therefore, we compared the ability of collectins and pentraxins to inhibit the activity of the viral NA. The NA activity of HKx31 was inhibited by SP-D (Fig. 3A) and MBL (Fig. 3B), and this effect was reversed in the presence of mannan, a complex polymer of mannose residues. Consistent with previous reports (23), PTX3 (Fig. 3C) also inhibited the NA of HKx31, and this activity was unaffected in the presence of mannan. Inhibition of influenza virus NA activity by human SP-D, MBL, and PTX3. A constant dilution of HKx31 (A–C) was incubated with increasing concentrations of human SP-D (A), MBL (B), or PTX3 (C) in the presence (▽) or absence of mannan (▼), or D–F, H1N1 viruses PR8/34 (▪), Bel/42 (□), Brazil/78 (●), Sol/06 (♦), Cal/09 (▴), and Auck/09 (△) were incubated with increasing concentrations of human SP-D (D), MBL (E), or PTX3 (F) and assayed for NA activity, as described in Materials and Methods. Data represent the percentage of inhibition of virus in comparison with virus-alone control. Data are representative of at least two independent experiments. NA activity of H1N1 virus strains Bel/42, Brazil/78, and Sol/06 was strongly inhibited in the presence of SP-D (Fig. 3D) and MBL (Fig. 3E), whereas neither could effectively inhibit PR8/34, Cal/09, or Auck/09 viruses at concentrations up to 10 μg/ml. Of interest, this pattern of inhibition correlated with the degree of glycosylation of the HA, not the NA (Tables I, II, respectively), and also with the reactivity of MBL against H1N1 viruses in HI assay, as described above. These findings are consistent with inhibition of NA activity resulting from steric hindrance of the active site of NA by SP-D/MBL that has bound to mannose-rich glycans on neighboring HA molecules on the virion. The inhibitory activity of SP-D and MBL against NA activity of H1N1 viruses was abrogated by the inclusion of mannan (data not shown). In contrast to the data obtained with SP-D and MBL, the NA activity of H1N1 virus strains was not inhibited in the presence of PTX3 (Fig. 3F). In humans, bronchial and alveolar epithelial cells represent the major target for influenza virus infection and subsequent amplification in the respiratory tract. Therefore, a critical role of the collectins and PTX3 in antiviral host defense would be to block or inhibit infection of airway epithelial cells by influenza virus. To test this, we used a neutralization assay to determine the ability of human SP-D, MBL, or PTX3 to inhibit infection of A549 cells, a human alveolar epithelial cell line, by HKx31 (H3N2) or H1N1 viruses. Given the marked sensitivity of particular H1N1 viruses to SP-D and MBL in HI and NA inhibition assays, our initial experiments demonstrated that both SP-D (Fig. 4A) and MBL (Fig. 4B) were potent in their ability to neutralize H1N1 virus Brazil/78 and that this activity could be reversed in the presence of mannan. Note that inclusion of 100 mM monosaccharide d-mannose, but not l-rhamnose, also reversed the neutralizing activity of SP-D or MBL (data not shown). As H1N1 viruses were largely resistant to inhibition by PTX3 (Fig. 3), we used HKx31 to confirm the neutralizing activity of human PTX3 against susceptible strains of influenza virus and to demonstrate that inclusion of mannan does not abolish its neutralizing activity (Fig. 4C). Neutralization of influenza viruses by human SP-D, MBL, and PTX3. 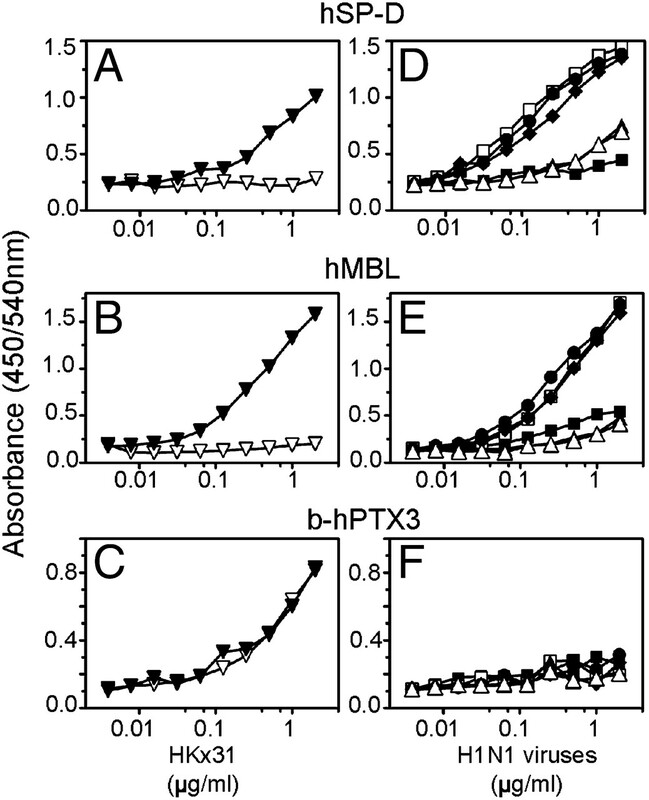 A constant dilution of either Brazil/78 (A, B; ●,○) or HKx31 (C; ▾, ▽) was incubated with increasing concentrations of human SP-D (A), MBL (B), or PTX3 (C) in TBS plus 10 mM CaCl2 supplemented with (○,▽) or without (●, ▼) mannan, and the amount of infectious virus remaining was determined by fluorescent-focus assay on A549 cell monolayers. In additional experiments, increasing concentrations of human SP-D (D), MBL (E), or PTX3 (F) in TBS plus 10 mM CaCl2 were incubated with constant dilutions of either PR8/34 (▪), Bel/42 (□), Brazil/78 (●), Sol/06 (♦), Cal/09 (▴), or Auck/09 (△), and the amount of infectious virus remaining was determined, as described in Materials and Methods. Inhibition of neutralization was examined by adding mannan to the innate immune proteins 20 min before the addition of virus. The final concentration of mannan in the virus-immune protein mixes was 5 mg/ml. Data are representative of three independent experiments. 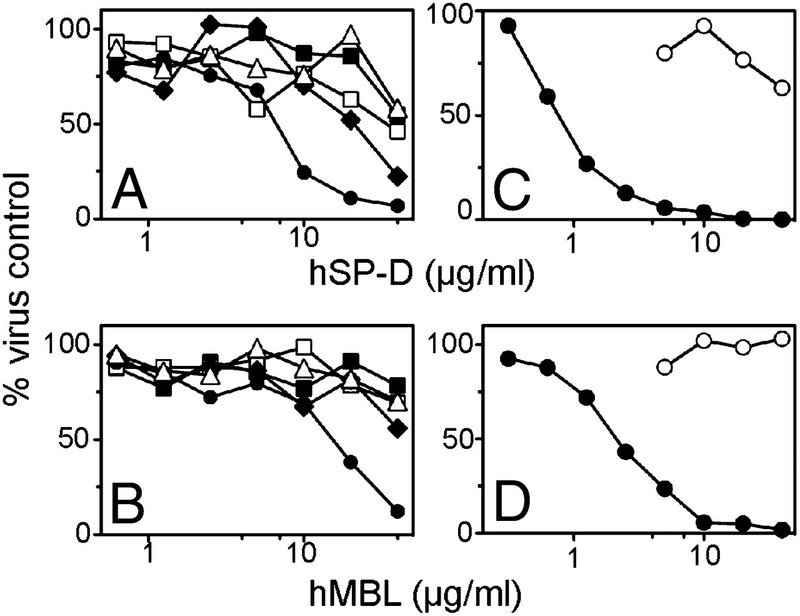 SP-D and MBL mediated potent neutralizing activity against the highly glycosylated H1N1 virus strains Bel/42, Brazil/78, and Sol/06 (Fig. 3E), as well as USSR/77 and Bris/07 (data not shown), but not against PR8/34, Cal/09, or Auck/09 (Fig. 4D, 4E), or NWS/33 and WS/33 (data not shown), which bear lower levels of glycosylation on the head of their respective HA molecules (Table I). PTX3 did not neutralize any of the H1N1 virus strains tested at concentrations of up to 10 μg/ml (Fig. 4F). To determine whether particular glycosylation sites on the H1 HA influence sensitivity to innate inhibitors, we used site-directed mutagenesis to create particular glycosylation sites in the PR8/34 HA, and viruses were generated using reverse genetics. An additional virus expressing all genes of PR8/34 with the HA of Brazil/78 (RG-PR8-Brazil/78 HA) was also generated. As seen in Fig. 5, addition of a N-glycosylation site at residue 104, 172, or 177 was not associated with substantial increases in sensitivity to either SP-D (Fig. 5A) or MBL (Fig. 5B), whereas addition of site 144 led to a marked increase in sensitivity to either collectin. Note that reverse genetics virus bearing the Brazil/78 HA was highly sensitive to neutralization by both SP-D (Fig. 5C) and MBL (Fig. 5D), and that the neutralizing activity of either collectin was blocked in the presence of mannan. None of the reverse genetics viruses tested were sensitive to neutralization by PTX3 at concentrations of up to 20 μg/ml (data not shown). Effect of particular sites of HA glycosylation on the ability of SP-D and MBL to neutralize RG viruses bearing the PR8/34 HA. Dilutions of human SP-D (A) or human MBL (B) in TBS plus 10 mM CaCl2 were mixed with RG-PR8 HA (wild-type) (▪), RG-PR8 HA (+104) (□), RG-PR8 HA (+144) (●), RG-PR8 HA (+172) (♦), or RG-PR8 HA (+177) (△) viruses, incubated for 30 min at 37°C, and the amount of infectious virus remaining was determined by fluorescent-focus assay on A549 cell monolayers. In addition, dilutions of SP-D (C) or MBL (D) were incubated in the presence (○) or absence (●) of mannan for 20 min prior to the addition of RG-Brazil/78 HA, and a neutralization assay was performed on A549 cells. Data are representative of two independent experiments. The case fatality rate of the current pandemic infection is still unclear, but it is estimated to be somewhat higher than that of seasonal influenza infections (6). In most cases, the pandemic virus causes an uncomplicated respiratory disease with symptoms similar to that caused by seasonal viruses, but a minority of patients develop viral pneumonia, which can lead to acute respiratory distress syndrome and death (7, 43). Unlike seasonal influenza in which morbidity and mortality are generally seen in the elderly, pandemic H1N1 infections are generally associated with younger individuals. It is important to understand how the pathogenesis of pandemic H1N1 infections differs from that of seasonal influenza infections. The A(H1N1) pdm virus does not possess the genetic motifs of virulence associated with either highly pathogenic avian influenza H5N1 or 1918 H1N1 viruses (44). Of interest, a number of studies have established that seasonal and pandemic H1N1 viruses elicit similar innate responses from human airway cells. Seasonal and pandemic H1N1 viruses were both poor in their ability to induce expression of antiviral and inflammatory cytokine genes from human dendritic cells and macrophages (45), and did not differ in ability to induce proinflammatory cytokines from human pneumocytes and bronchiolar epithelial cells (46). Recognition of sialylated residues on NKp46 by the HA of seasonal or pandemic H1N1 viruses also induced NK cell-mediated killing of virus-infected target cells (47). Attachment of the influenza virus HA glycoprotein to sialic moieties on the cell surface is a critical first step in the initiation of infection. The ability of influenza viruses to bind to particular sialic acid linkages is determined by the receptor-binding site of the viral HA and is a critical determinant of virus tropism. Initial studies demonstrated preferential binding of A(H1N1) pdm viruses to α2,6-linked sialic acids (11) although subsequent glycan array data indicate significant binding to both α2,6-linked and α2,3-linked sialic acids, unlike seasonal H1N1 viruses that showed a distinct preference for α2,6-linked sialic acids (48). Seasonal H1N1, H3N2, and A(H1N1) pdm viruses replicated to comparable levels in ex vivo cultures of human nasopharynx and lung tissues, but human conjunctiva showed preferential susceptibility to infection by A(H1N1) pdm (46), consistent with subtle differences in receptor specificity that could potentially affect pathogenesis in humans. The long pentraxin PTX3 carries α(2,3)-Gal–linked sialic acid (49) and acts as a sialylated glycoprotein inhibitor of H3 subtype influenza viruses (23). Human H3 influenza viruses isolated between 1968 and 1975 exhibit a dual specificity for both α(2,3)-Gal–linked and α(2,6)-Gal–linked sialic acids (50) and were sensitive to inhibition by PTX3 (23), whereas later H3 viruses prefer α(2,6)-Gal–linked sialic acids and were PTX3 resistant. In the current study, we demonstrate that neither seasonal H1N1 viruses nor A(H1N1) pdm viruses were sensitive to inhibition by PTX3 (Figs. 3, 4). In addition to the specificity of HA, the viral NA plays a critical role in determining PTX3 sensitivity, as the sialic acid moiety on PTX3 must resist hydrolysis by NA for neutralization to occur. Thus, the specificity and activity of the N1 versus N2 NA are likely to be another factor contributing to differences between H3N2 and H1N1 viruses in PTX3 sensitivity. PTX3 levels increase in lung fluids of mice following infection with influenza viruses that are sensitive or resistant to PTX3 (23), and recent reports defining the ability of PTX3 to regulate pulmonary inflammation (51) suggest it could play a role in protective immunity, even in the absence of pathogen recognition. In future studies, it will be of interest to determine the sensitivity of H1N1 viruses to human SP-A because this glycoprotein inhibitor expresses both α(2,3)-Gal–linked and α(2,6)-Gal–linked sialic acids (52), and therefore might be more effective against a broader range of human influenza viruses. SP-D and MBL bind to both the HA and NA glycoproteins of influenza virus with the majority of binding to the viral HA (15, 40, 53). In previous studies, the degree of glycosylation of the HA of H1N1 and H3N2 virus strains was shown to be critical in determining sensitivity to HI by SP-D (39). Furthermore, inhibition of viral NA activity has been proposed to result from steric hindrance of the HA active site by collectins bound to neighboring HA molecules on the virion (15, 41). In this study, we demonstrate that SP-D and MBL did not inhibit NA activity of A(H1N1) pdm viruses (Fig. 3), despite the presence of three potential N-glycosylation sequons on the head of N1 (Table II). SP-D and MBL were, however, potent inhibitors of seasonal H1N1 viruses that carried the same (Brazil/78, Bel/42) or fewer (Bris/07, Sol/06) N-glycosylation sequons on NA (Table II), but markedly more sites in the globular head region of HA (Table I). Human SP-D and MBL also neutralized the infectivity of H1N1 IAV viruses for A549 cells in a manner that correlated with glycosylation of the viral HA (Fig. 4). SP-D is produced constitutively in the airways, and levels in bronchoalveolar lavage (BAL) fluids increase during influenza infection in murine models (15). MBL is generally considered to be a plasma protein, produced in the liver as an acute-phase reactant, and secreted into the circulation, yet MBL has been detected in human BAL (18, 28) and in BAL from influenza virus-infected mice (15), suggesting it can transude into the airways during inflammation of the lung. As airway epithelial cells represent the primary target of influenza virus infection in the human respiratory tract, SP-D and MBL may represent an important barrier to establishment of infection of epithelial cells. Moreover, their ability to inhibit the enzymatic activity of the viral NA might also limit release and spread of newly synthesized virions in the lungs. Levels of SP-D, MBL, and PTX3 in human BAL have been reported at levels of 500–1100 (54, 55), 150–200 (18, 56), and ∼5 ng/ml (57), respectively, and are likely to be considerably higher in situ due to the marked dilution associated with the BAL technique. Among different influenza viruses, there is extensive variation in the number and location of glycosylation sites on the head region of HA, whereas stem oligosaccharides tend to be highly conserved. In the process of antigenic drift, accumulation of glycosylation on the head of HA may mask or modify neutralizing epitopes on the HA surface (24, 58). Recent seasonal H1N1 viruses carry three to five sites of N-linked glycosylation on the globular head of HA, whereas SC1918 and Cal/09 A(H1N1) pdm viruses have a single site at Asn104 (25–27, 59). The HA molecules expressed by H1N1 viruses from the 1930s (NWS/33, WS/33, and PR8/34) used in our studies were poorly glycosylated and, accordingly, all strains were resistant to SP-D and MBL. Note that addition of Asn104 to the head of the PR8/34 HA did not increase its sensitivity to collectins, whereas addition of Asn144 did (Fig. 5), consistent with our findings that early H1N1 pdm viruses express only Asn104 and are resistant to SP-D and MBL. In contrast, Bel/42 and seasonal viruses isolated following the re-emergence of the H1N1 subtype in 1977 (USSR/77, Brazil/78, Sol/06, and Bris/07) possessed three to four N-glycosylation sequons on the head of HA (Table I) and were highly sensitive to inhibition by collectins. Given the multimeric nature of the collectins, addition of multiple glycosylation sites to the head of HA may promote an increased avidity of binding, and therefore potent antiviral activity. Recently circulating A(H1N1) pdm are genetically uniform (60); however, there is great concern that they could evolve to a more pathogenic variant in humans. In the human population, A(H1N1) pdm viruses are now likely to be subject to Ab-mediated selection pressure as a result of natural infection and/or vaccination with homologous virus strains. Igarashi et al. (59) defined a Cand1 site as a three-codon motif that becomes an N-glycosylation site following a single nucleotide mutation and three Cand1 sites are expressed on Cal/09 HA at residues 177, 179, and 184 (26). Of the 2838 HA sequences of A(H1N1) pdm viruses deposited in the GenBank database (as of April 22, 2010), A/Myanmar/JP90/2009 (GenBank Accession GU014756) and A/Nagasaki/HA-62/2009 (GenBank Accession AB536770) have lost Asn104 and so lack any N-glycosylation sites in the globular head region of HA (PDB ID: 1RU7, http://www.pdb.org/pdb/explore/explore.do?structureId=1RU7). In contrast, A/Catalonia/S2151/2009 (GenBank Accession CY054584.1) and A/Orenburg/IIV-13/2010 (GenBank Accession HM124383.1) retain Asn104, but have acquired additional N-glycosylation sequons at Asn179, or at Asn179 and Asn136, respectively. Analysis of seasonal H1N1 viruses shows that Asn179 was also present in Bel/42 (Table I). Asn179 and Asn136 are located on the tip of the HA spike (Fig. 1A) and, if glycosylated, could markedly enhance susceptibility of A(H1N1) pdm viruses to neutralization by SP-D and/or MBL. It has been proposed that the addition of new oligosaccharide glycans to HA is an important factor for sustained circulation of influenza viruses in the human population (24, 61); however, the degree of HA glycosylation may be limited by the fine balance between protection afforded by masking antigenic sites on the HA versus increased sensitivity to proteins of the innate immune system. We acknowledge the Australian Red Cross Blood Service for the provision of MBL used in this study and the Australian governments, which fully fund the Blood Service for the provision of blood products and services to the Australian community. We thank Dr. Robert Webster, St. Jude Children’s Research Hospital (Memphis, TN), for provision of the plasmid vector used to create the reverse engineered viruses for this study. This work was supported by Project Grant 509230 from the National Health and Medical Research Council of Australia and Grant 1 PO1 A1083222 from the National Institutes of Health (to E.C.C.). P.C.R. is a National Health and Medical Research Council R.D. Wright Research Fellow. The Melbourne World Health Organization Collaborating Centre for Reference and Research on Influenza is supported by the Australian Government Department of Health and Ageing. World Health Organization. Available at: http://www.who.int/csr/disease/swineflu/updates/en/.Accessed May 17, 2010.
. 2003. 1918 influenza pandemic caused by highly conserved viruses with two receptor-binding variants. Emerg. Infect. Dis. 9: 1249–1253.
. 2009. Pandemic influenza—including a risk assessment of H5N1. Rev. Sci. Tech. 28: 187–202.
. 1978. Recent human influenza A (H1N1) viruses are closely related genetically to strains isolated in 1950. Nature 274: 334–339.
. 1978. Antigenic similarity of influenza A (H1N1) viruses from epidemics in 1977–1978 to “Scandinavian” strains isolated in epidemics of 1950–1951. Virology 89: 632–636.
. 2009. Antigenic and genetic characteristics of swine-origin 2009 A(H1N1) influenza viruses circulating in humans. Science 325: 197–201.
. 2009. Emergence of a novel swine-origin influenza A (H1N1) virus in humans. N. Engl. J. Med. 360: 2605–2615.
. 2009. In vitro and in vivo characterization of new swine-origin H1N1 influenza viruses. Nature 460: 1021–1025.
. 2009. Serum cross-reactive antibody response to a novel influenza A (H1N1) virus after vaccination with seasonal influenza vaccine. MMWR Morb. Mortal. Wkly. Rep. 58: 521–524.
. 2009. Cross-reactive antibody responses to the 2009 pandemic H1N1 influenza virus. N. Engl. J. Med. 361: 1945–1952.
. 2009. Transmission and pathogenesis of swine-origin 2009 A(H1N1) influenza viruses in ferrets and mice. Science 325: 484–487.
. 2009. Pathogenesis and transmission of swine-origin 2009 A(H1N1) influenza virus in ferrets. Science 325: 481–483.
. 1995. Interactions of surfactant protein A with influenza A viruses: binding and neutralization. J. Infect. Dis. 171: 335–341.
. 1997. Mechanisms of anti-influenza activity of surfactant proteins A and D: comparison with serum protection. Am. J. Physiol. 273: 1156–1166.
. 1997. Collectin-mediated antiviral host defense of the lung: evidence from influenza virus infection of mice. J. Virol. 71: 8204–8212.
. 1993. Human mannose-binding protein functions as an opsonin for influenza A viruses. J. Clin. Invest. 91: 1414–1420.
. 1994. Evidence for a protective role of pulmonary surfactant protein D (SP-D) against influenza A viruses. J. Clin. Invest. 94: 311–319.
. 2009. Mannose-binding lectin is present in the infected airway: a possible pulmonary defence mechanism. Thorax 64: 150–155.
. 2007. Glycosylation as a target for recognition of influenza viruses by the innate immune system. Adv. Exp. Med. Biol. 598: 279–292.
. 2008. Critical role for cross-linking of trimeric lectin domains of surfactant protein D in antiviral activity against influenza A virus. Biochem. J. 412: 323–329.
. 2001. Surfactant protein D enhances clearance of influenza A virus from the lung in vivo. J. Immunol. 167: 5868–5873.
. 2007. Virus glycosylation: role in virulence and immune interactions. Trends Microbiol. 15: 211–218.
. 2008. Antiviral activity of the long chain pentraxin PTX3 against influenza viruses. J. Immunol. 180: 3391–3398.
. 2004. Effect of the addition of oligosaccharides on the biological activities and antigenicity of influenza A/H3N2 virus hemagglutinin. J. Virol. 78: 9605–9611.
. 2004. Tracking global patterns of N-linked glycosylation site variation in highly variable viral glycoproteins: HIV, SIV, and HCV envelopes and influenza hemagglutinin. Glycobiology 14: 1229–1246.
. 2010. Predicting the antigenic structure of the pandemic (H1N1) 2009 influenza virus hemagglutinin. PLoS One 5: e8553.
. 1999. Origin and evolution of the 1918 “Spanish” influenza virus hemagglutinin gene. Proc. Natl. Acad. Sci. USA 96: 1651–1656.
. 2007. N-linked glycosylation attenuates H3N2 influenza viruses. J. Virol. 81: 8593–8600. 1969. Future influenza vaccines and the use of genetic recombinants. Bull. World Health Organ. 41: 643–645.
. 1990. Bovine and mouse serum β inhibitors of influenza A viruses are mannose-binding lectins. Proc. Natl. Acad. Sci. USA 87: 4485–4489.
. 1994. Complement-dependent neutralization of influenza virus by a serum mannose-binding lectin. J. Gen. Virol. 75: 615–622.
. 1999. Generation of influenza A viruses entirely from cloned cDNAs. Proc. Natl. Acad. Sci. USA 96: 9345–9350.
. 2004. The structure and receptor binding properties of the 1918 influenza hemagglutinin. Science 303: 1838–1842.
. 2006. The structure of H5N1 avian influenza neuraminidase suggests new opportunities for drug design. Nature 443: 45–49.
. 2005. The Molecular Biology Toolkit (MBT): a modular platform for developing molecular visualization applications. BMC Bioinformatics 6: 21.
. 1996. Interactions of recombinant human pulmonary surfactant protein D and SP-D multimers with influenza A. Am. J. Physiol. 271: L753–L762.
. 2006. Heteroligomeric forms of codon 54 mannose binding lectin (MBL) in circulation demonstrate reduced in vitro function. Mol. Immunol. 43: 950–961.
. 1997. Multimer formation and ligand recognition by the long pentraxin PTX3: similarities and differences with the short pentraxins C-reactive protein and serum amyloid P component. J. Biol. Chem. 272: 32817–32823.
. 2008. Role of viral hemagglutinin glycosylation in anti-influenza activities of recombinant surfactant protein D. Respir. Res. 9: 65.
. 2000. Mechanism of binding of surfactant protein D to influenza A viruses: importance of binding to haemagglutinin to antiviral activity. Biochem. J. 351: 449–458.
. 2007. Inhibition of influenza viral neuraminidase activity by collectins. Arch. Virol. 152: 1731–1742.
. 1981. Structure of the haemagglutinin membrane glycoprotein of influenza virus at 3 A resolution. Nature 289: 366–373.
. 2009. Critically ill patients with 2009 influenza A(H1N1) infection in Canada. JAMA 302: 1872–1879.
. 2009. Emergence and pandemic potential of swine-origin H1N1 influenza virus. Nature 459: 931–939.
. 2010. Pandemic H1N1 2009 influenza A virus induces weak cytokine responses in human macrophages and dendritic cells and is highly sensitive to the antiviral actions of interferons. J. Virol. 84: 1414–1422.
. 2010. Tropism and innate host responses of the 2009 pandemic H1N1 influenza virus in ex vivo and in vitro cultures of human conjunctiva and respiratory tract. Am. J. Pathol. 176: 1828–1840.
. 2010. Killing of avian and Swine influenza virus by natural killer cells. J. Virol. 84: 3993–4001.
. 2009. Receptor-binding specificity of pandemic influenza A (H1N1) 2009 virus determined by carbohydrate microarray. Nat. Biotechnol. 27: 797–799.
. 2006. Structure and function of the long pentraxin PTX3 glycosidic moiety: fine-tuning of the interaction with C1q and complement activation. Biochemistry 45: 11540–11551.
. 1998. Changes in H3 influenza A virus receptor specificity during replication in humans. Virus Res. 56: 169–176.
. 2010. Regulation of leukocyte recruitment by the long pentraxin PTX3. Nat. Immunol. 11: 328–334.
. 2008. Inhibition of hemagglutination activity of influenza A viruses by SP-A1 and SP-A2 variants expressed in CHO cells. Med. Microbiol. Immunol. 197: 9–12.
. 1997. Structure of a truncated human surfactant protein D is less effective in agglutinating bacteria than the native structure and fails to inhibit haemagglutination by influenza A virus. Biochem. J. 323: 393–399.
. 2008. Chronic obstructive pulmonary disease and inhaled steroids alter surfactant protein D (SP-D) levels: a cross-sectional study. Respir. Res. 9: 13.
. 1999. Deficient hydrophilic lung surfactant proteins A and D with normal surfactant phospholipid molecular species in cystic fibrosis. Am. J. Respir. Cell Mol. Biol. 20: 90–98.
. 2007. AIDS patients have increased surfactant protein D but normal mannose binding lectin levels in lung fluid. Respir. Res. 8: 42.
. 2008. Pentraxin 3 in acute respiratory distress syndrome: an early marker of severity. Crit. Care Med. 36: 2302–2308.
. 1984. A carbohydrate side chain of hemagglutinin of Hong Kong influenza viruses inhibits recognition by a monoclonal antibody. Proc. Natl. Acad. Sci. USA 81: 1779–1783.
. 2008. Genetically destined potentials for N-linked glycosylation of influenza virus hemagglutinin. Virology 376: 323–329.
. 2009. Origins and evolutionary genomics of the 2009 swine-origin H1N1 influenza A epidemic. Nature 459: 1122–1125. 1997. Effects of glycosylation on the properties and functions of influenza virus hemagglutinin. J. Infect. Dis. 176(Suppl. 1): S24–S28.